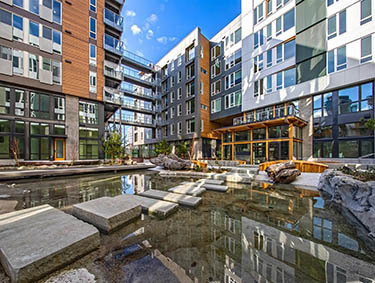 Sitka is a mixed-use development at 1255 Harrison St. in South Lake Union, with 365 apartments, 19 townhouse/lofts and more than 3,300 square feet of retail space. 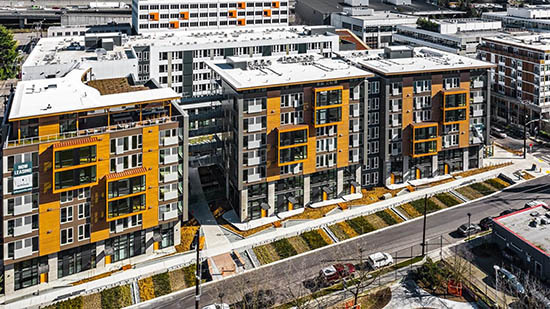 The building has two levels of underground parking, with e-car charging stations, bike storage and tenant storage units. Amenities include a clubhouse on level 7, with kitchen, pool table and AV system for entertaining. 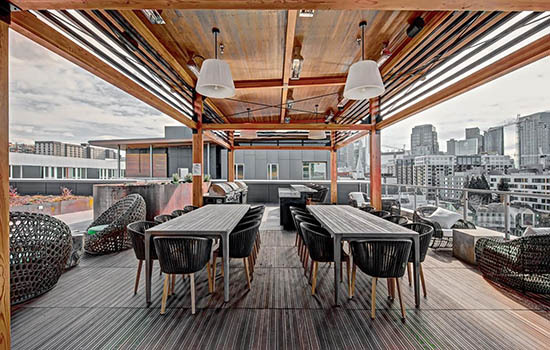 The exterior patio has three barbecue stations with outdoor eating and seating. On level 2 and 1 there are additional lounges for residents. There is a dog run and dog lounge for entertaining. 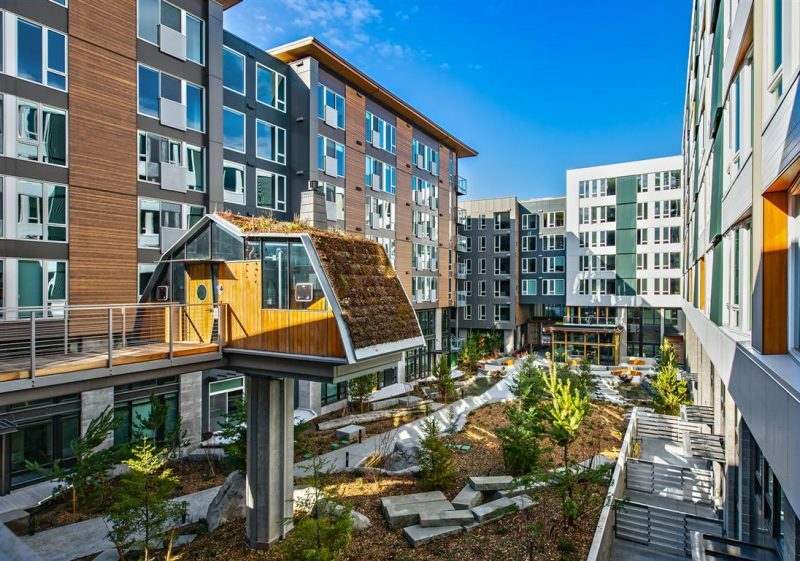 The interior courtyard, which is designed to resemble the San Juan Islands, is landscaped with rock walls, a running stream, a pond with fiber-optic lights and a fog feature. A “treehouse” space with a working fireplace overlooks the pond. The southeast building has a sloping green roof; the northwest building roof has an urban farm. 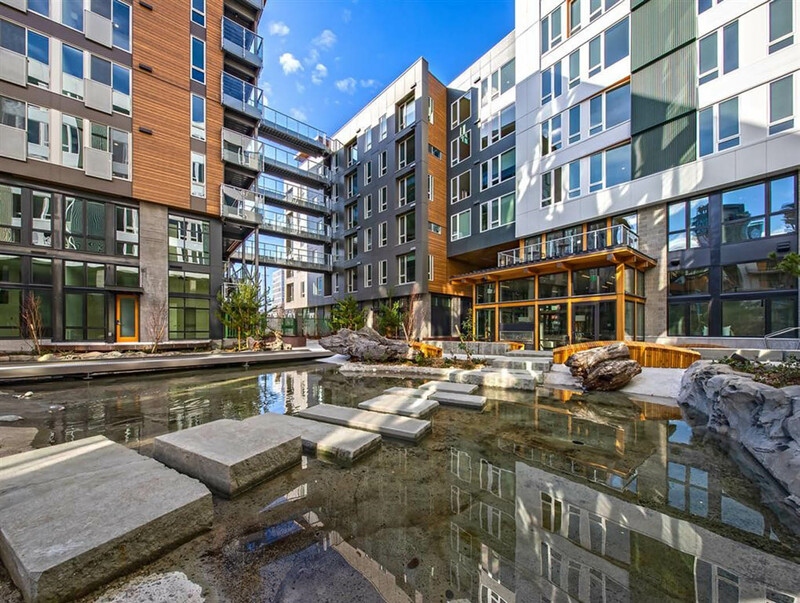 The development uses two highly efficient and environmentally friendly systems — waste water recovery and gray water harvesting. LEED consultant: O’Brien & Co.
Traffic consultant: Heffron Transportation, Inc.